What’s better on sunny Winters afternoon than a nice cup of tea and a cookie? In fact, they go so well together that I thought I’d combine the two into one recipe and see what happened. The result was my rooibos coco-almond cookies! Infusion or straight up leaves? I thought about steeping the tea into the coconut oil to produce an infusion, but being the rather impatient lady I am, I quickly forgot about this whimsical idea and ground the rooibos leaves in a mortar and pestle. 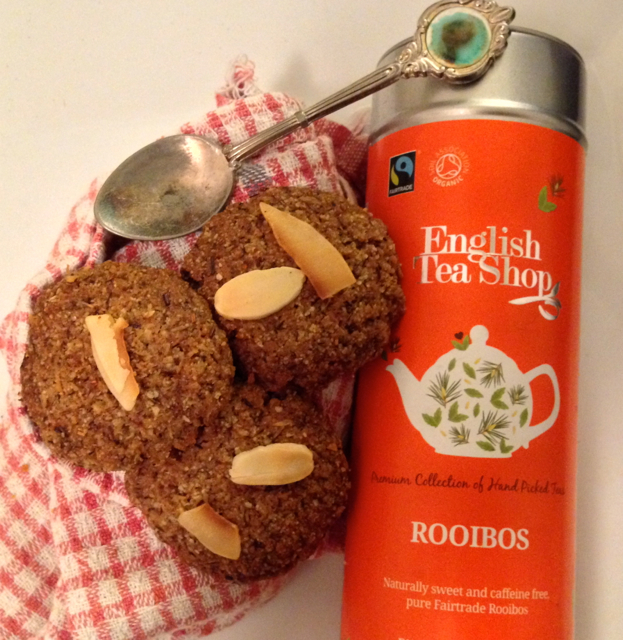 I think this gave the cookies a stronger rooibos flavour, which is just what you need with a mild tasting tea. Preheat oven to 150 degrees celsius. Line a baking tray with baking paper. Grind rooibos in a mortar and pestle for approximately two minutes. In a jug combine coconut oil with honey and vanilla essence and stir to combine. In a large bowl combine coconut oil mixture with other ingredients and mix well. Roll into balls (just over a tsp of mixture per ball) and flatten slightly on baking tray. Decorate with slivered almonds and coconut flakes. Bake for 20 mins or until golden brown. Store in a airtight container.